Varied exhibits in twelve buildings showcase the lives of pioneers from the 1870s to the 1980s. 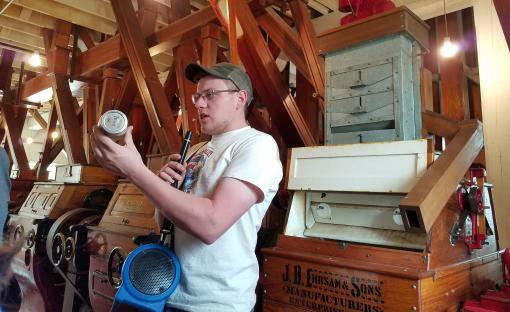 Visit a rare, fully restored 1898 flour mill and learn how Kansas wheat was made into flour. Also, see the mill in operation the first weekend in May. Explore the 1904 Swedish Pavilion, built for the St. Louis World's Fair. Styled after country manor houses in Sweden. Visit school days of long ago with a visit to the 1903 West Kentucky one-room school and the Bethany Academy. Learn about travel in 1979 at the Union Pacific Depot and nearby locomotive. Visit a general store, bank, ladies shop and livery to learn more about early town life. Take a look at farm work through a variety of tools and equipment including a Rumley oil-pull tractor and Yellow Kid threshing machine. See how residents influenced the larger world at Sweadal, the first county courthouse and the Erickson workshop. View technology invented by the Ericksons that helped develop the telephone dial. If you have ancestors who lived in McPherson County, visit the research library.Contact the museum in advance for an appointment to make sure there are staff members to assist you. While here, enjoy a picnic beside the Smoky Hill River or camp overnight. The scenic campground offers electricity and water. Check in at the museum front desk.